buried in the snow. Inside, they found the body of Captain Scott wedged between those of his fellow explorers, the flaps of his sleeping bag thrown back, his coat open. His companions, Lieut. Henry Bowers and Dr. Edward Wilson, lay covered in their sleeping bags as if dozing. They had been dead for eight months. They were the last members of a five-man team returning to their home base from the Pole. The team had set out on its final push to the Pole the previous January. They knew they were in a race to be the first to reach their destination. Their competition was a Norwegian expedition lead by Roald Amundsen. The two expeditions employed entirely different strategies. Amundsen relied on dogs to haul his men and supplies over the frozen Antarctic wasteland. Scott's British team distrusted the use of dogs preferring horses, once these died from the extreme conditions the sleds were man-hauled to the Pole and back. In fact, Scott deprecated the Norwegian's reliance on dogs. Their use was somehow a less manly approach to the adventure and certainly not representative of the English tradition of "toughing it out" under extreme circumstances. Man could manage Nature. A similar spirit guided the building of the "unsinkable" Titanic and then supplied the ship with far too few lifeboats to hold its passengers if disaster did strike. Just as the passengers of the Titanic paid a price for this arrogance, so too did Captain Scott and his four companions. "Wednesday, January 17 - Camp 69. T. -22 degrees at start. Night -21 degrees. The Pole. Yes, but under very different circumstances from those expected. We have had a horrible day - add to our disappointment a head wind 4 to 5, with a temperature -22 degrees, and companions labouring on with cold feet and hands. this is an awful place..."
We started at 7.30, none of us having slept much after the shock of our discovery. We followed the Norwegian sledge tracks for some way; as far as we make out there are only two men. In about three miles we passed two small cairns. Then the weather overcast, and the tracks being increasingly drifted up and obviously going too far to the West, we decided to make straight for the Pole according to our calculations. At 12.30 Evans had such cold hands we camped for lunch - an excellent 'week-end one.' ...To-night little Bowers is laying himself out to get sights in terrible difficult circumstances; the wind is blowing hard, T. - 21 degrees, and there is that curious damp, cold feeling in the air which chills one to the bone in no time. We have been descending again, I think, but there looks to be a rise ahead; otherwise there is very little that is different from the awful monotony of past days. Great God! this is an awful place and terrible enough for us to have laboured to it without the reward of priority. Well, it is something to have got here, and the wind may be our friend to-morrow. ...Now for the run home and a desperate struggle. I wonder if we can do it. Thursday morning, January 18 - ...We have just arrived at this tent, 2 miles from our camp, therefore about l 1/2 miles from the Pole. In the tent we find a record of five Norwegians having been here... We carried the Union Jack about 3/4 of a mile north with us and left it on a piece of stick as near as we could fix it. ...Well, we have turned our back now on the goal of our ambition and must face our 800 miles of solid dragging - and good-bye to most of the day-dreams!" "Saturday, February 17 - A very terrible day. Evans looked a little better after a good sleep, and declared, as he always did, that he was quite well. He started in his place on the traces, but half an hour later worked his ski shoes adrift, and had to leave the sledge. The surface was awful, the soft recently fallen snow clogging the ski and runners at every step, the sledge groaning, the sky overcast, and the land hazy. We stopped after about one hour, and Evans came up again, but very slowly. Half an hour later he dropped out again on the same plea. He asked Bowers to lend him a piece of string. I cautioned him to come on as quickly as he could, and he answered cheerfully as I thought. We had to push on, and the remainder of us were forced to pull very hard, sweating heavily. Abreast the Monument Rock we stopped, and seeing Evans a long way astern, I camped for lunch. There was no alarm at first, and we prepared tea and our own meal, consuming the latter. After lunch, and Evans still not appearing, we looked out, to see him still afar off. By this time we were alarmed, and all four started back on ski. I was first to reach the poor man and shocked at his appearance; he was on his knees with clothing disarranged, hands uncovered and frostbitten, and a wild look in his eyes. Asked what was the matter, he replied with a slow speech that he didn't know, but thought he must have fainted. We got him on his feet, but after two or three steps he sank down again. He showed every sign of complete collapse. 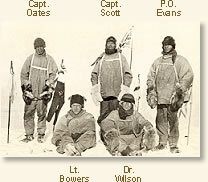 Wilson, Bowers, and I went back for the sledge, whilst Oates remained with him. When we returned he was practically unconscious, and when we got him into the tent quite comatose. He died quietly at 12.30 A.M. On discussing the symptoms we think he began to get weaker just before we reached the Pole, and that his downward path was accelerated first by the shock of his frostbitten fingers, and later by falls during rough travelling on the glacier, further by his loss of all confidence in himself. Wilson thinks it certain he must have injured his brain by a fall. It is a terrible thing to lose a companion in this way, but calm reflection shows that there could not have been a better ending to the terrible anxieties of the past week. Discussion of the situation at lunch yesterday shows us what a desperate pass we were in with a sick man on our hands at such a distance from home." and may be some time." afternoon march. In spite of its awful nature for him he struggled on and we made a few miles. At night he was worse and we knew the end had come. Should this be found I want these facts recorded. Oates' last thoughts were of his Mother, but immediately before he took pride in thinking that his regiment would be pleased with the bold way in which he met his death. We can testify to his bravery. He has borne intense suffering for weeks without complaint, and to the very last was able and willing to discuss outside subjects. He did not - would not - give up hope till the very end. He was a brave soul. This was the end. He slept through the night before last, hoping not to wake; but he woke in the morning - yesterday. It was blowing a blizzard. He said, 'I am just going outside and may be some time.' He went out into the blizzard and we have not seen him since." "Wednesday, March 21 - Got within 11 miles of depot Monday night; had to lay up all yesterday in severe blizzard. To-day forlorn hope, Wilson and Bowers going to depot for fuel. Thursday, March 22 and 23 - Blizzard bad as ever - Wilson and Bowers unable to start - to-morrow last chance - no fuel and only one or two of food left - must be near the end. Have decided it shall be natural - we shall march for the depot with or without our effects and die in our tracks. Thursday, March 29 - Since the 21st we have had a continuous gale from W.S.W. and S.W. We had fuel to make two cups of tea apiece and bare food for two days on the 20th. Every day we have been ready to start for our depot 11 miles away, but outside the door of the tent it remains a scene of whirling drift. I do not think we can hope for any better things now. We shall stick it out to the end, but we are getting weaker, of course, and the end cannot be far. It seems a pity, but I do not think I can write more. For God's sake look after our people." Huntford, Roland, Scott and Amundsen (1984); Preston, Diana, A First Rate Tragedy (1998); Scott, Robert F., Scott's Last Expedition vol. I, The Journals of Captain R.F. 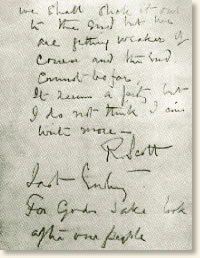 Scott (1913). "Doomed Expedition To The Pole, 1912," EyeWitness to History, www.eyewitnesstohistory.com (1999). 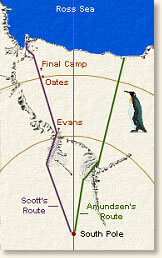 Scott's expedition would have covered a round-trip distance of 1766 miles from their base camp to the Pole.